The economical answer to repetitive numbering operations. Lettering bands (A-M) or (N-Z) can also be placed into any position at an additional cost. Knurled wheels for easy adjustment of bands and deeply moulded bands give a clear impression every time. Used in conjunction with a stamp pad, sold separately. Same as above but self-inking, which does not require a separate ink pad. Lettering bands (A-M) or (N-Z) can also be placed into any position at an additional cost. Deeply moulded bands give a clear impression every time. 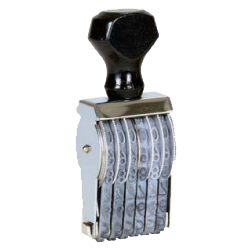 These band stamp numberers have 25.4mm (1″) tall number characters on a steel frame with a large wooden handle. 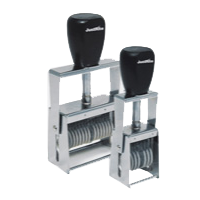 They are ideal for industrial applications or wherever a heavy-duty numberer is required. 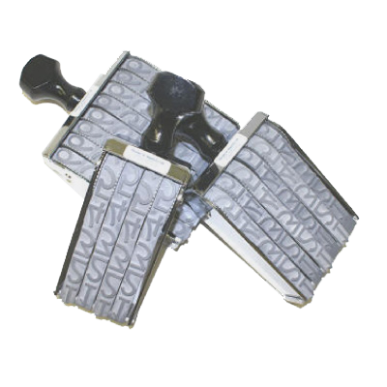 Used in conjunction with a stamp pad, supplied separately.